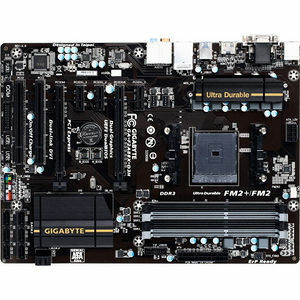 GIGABYTE FM2+ series motherboards based on AMD A88X chipset and feature the new FM2+ APU socket, and are designed to get the most from forthcoming Kaveri AMD APUs, while preserving compatibility for current AMD FM2 APUs. FM2+ AMD APUs offer native support for 8 GT/s PCI Express gen 3.0 as well as DX11.1 support integrating the high performance 'Steamroller' core. AMD socket FM2+ APUs also offer native support for 4K resolution displays on HDMI port.